Labor has the politics of superannuation badly wrong. Its core constituency would be much better off without it. So would the economy. But Labor has long promoted super as 'gift' to ordinary workers that it compels employers to provide. Recently, however, the superannuation minister Bill Shorten acknowledged that compulsory contributions to super come from money that could otherwise be paid as normal wages. Rather than being forced to hand the money over to fund managers to punt volatile financial markets, many employees could prefer to spend the money on their own priorities, such as raising a family, paying off a mortgage and improving their education. Shorten is pushing ahead with Labor's decision to increase compulsory super contributions to 12 per cent of salaries. Yet Treasury modelling has shown that even the existing 9 per cent, plus the age pension, will produce an incongruous outcome in which low income earners have a higher disposable income in retirement than while working. Shorten is now fighting union resistance to trading off the increase to 12 per cent against wage rises. If employers were allowed to convert the 9 per cent to a normal part of salaries, this would boost take home pay by $85 for those on average weekly earnings of $1333 and by around $45 for someone on the minimum wage of $589. Finding better things to do with this money than putting it into super should not be hard. Australian Prudential Regulatory Authority data show the average rate of return on super over the ten years to June 2011 was a meagre 3.8 per cent. Governments could also find better things to do with the money they spend on superannuation tax concessions that are heavily biased towards high income earners. The research director for financial information company Rainmaker, Alex Dunnin, says about half the value of the concessions goes to the 8 per cent of superannuation members who are in a self-managed super fund (SMSF). Tax office figures show 75,000 of these funds have assets between $2 million and $10 million. Two have more than $100 million. Yet 90 per cent of SMSFs have only one or two members. Dunnin estimates the average balance in not-for-profit industry funds is $44,000. The Henry tax report notes the cost of lifting contributions to 12 per cent will outweigh any savings on the age pension. Well before the 12 per cent rate is fully in place, official projections show the tax concessions will cost the budget over $42 billion in 2014–15. Even after subtracting offsets, scrapping the concessions should increase revenue by well over $30 billion a year. The concessions consume vast sums that could improve productivity and wellbeing through increased outlays on education, childcare, health, transport and well designed tax cuts. Until it tackles the concessions, Labor can forget about making serious headway on a new disabilities scheme, dental care and disadvantaged schools. Compulsory super also prevents the efficient allocation of resources by artificially boosting fees paid to fund managers and administrators by several billion a year. Not even the local car industry could dream of winning an assistance package in which governments compelled all Australians to buy its products, regardless of whether they had better things to do with their money. The vast bulk of the money in super is used to buy and sell existing financial assets. Only a tiny proportion goes directly into creating new productive capacity. Often one super fund merely swaps the ownership of a parcel of shares with another. Paul Keating says he changed superannuation while Treasurer from an elite system to one in which 'the bloke running behind the garbage truck could have super'. But a new elite has left the garbo in the dust. Unlike someone still working for the minimum wage, members of this elite pay no tax on retirement income from super, even if it is millions of dollars a year. Tax-free super income is also exempt from the means test for prescription drugs. This allows rich retirees to buy drugs for $5.80 a prescription compared to $35.40 for a minimum wage earner. But Labor refuses to abolish this rort, let alone tax those over 60 at normal rates. Given their limited resources, governments should not fund massive budget subsidies for super as well as the age pension. Once governments fund the pension as a decent safety net, they have fulfilled their basic welfare obligation to retirees. Anyone who wants to save more can do so. Apart from being impervious to financial market gyrations, the age pension is immune to a new problem peddled by the finance industry called 'longevity risk' — that your money could run out before you die. The age pension has the great advantage that it never runs out. The Keating plan was based on RBL's and had a minimal affect on income tax. When that system was dropped allowing people to make huge contributions we ended up with the tax imbalance referred to. There would have been savings from age pensions as the tax concessions would be far less.I am glad my wife and I do not have to "survive" on the Age Pension. I would not like to rely on any govt. to provide a liveable pension. Would the average punter really direct his added wages to health and education? Some super. funds must have lost an awful loss of income over the last 10 years. Even the most conservative Industry funds did better than that. I guess you cannot unscramble the system now. If we had stuck with the Keating plan we would be in a far better position. I have asked a lot of people if they know that employees forwent pay increases for super. contributions and all think employers meet the cost. Topics on superannuation are never straight forward although much of this article is in line with my thoughts. It took Bill Shorten long enough to wake up to the fact that compulsary contributions come from what would otherwise be normal pay. When first introduced the Government said that would not happen, and it didnt in the first year and partially in the second year. I have now "retired" three times, first at 66 next at 67 and lastly at 69. Each time people asked "Do you have enough to last" and my answer was "tell me how long it has to last". The first question is an indication that the person asking has a concern for their own retirement outlook. As for the answer if I am around for six years the partial pension will kick in if tthe rules don't change, another five years it will be getting tight. Even at 12% I don't believe the super savings will be enough when inflation is taked into account. What happens to those that retire at the start of galloping inflation. We took out our first homeloan at 6%, within two years it was 18%. How does the retiree handle that? Getting rid of compulsory superannuation would certainly be the most stupid thing ever done by any Government. Switzerland had a compulsory superannuation scheme which initially started in 1889 and received the roughly the current form in 1947. In the Swiss system, every employer and employee is contributing to the compulsory superannuation scheme. The system in Switzerland is called AHV and provides universal insurance to pensioners, orphans and widows. The AHV provides old-age pensions, pensions for surviving dependents, attendance allowances and medical support material. 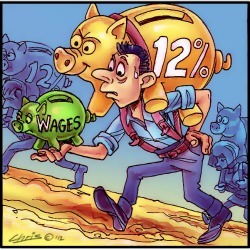 Pensions are adjusted to wage and price developments (mixed index). The minimum pension for persons who have contributed for the total period of 44 years is currently CHF 1140, and the maximum pension, CHF 2280. Many people also have work place private superannuation as well. The benefits of the system are that overall taxes in Switzerland remain considerable lower. Most pensioners have a decent income at retirement and remain an active part of the overall economy. It is however to remember that it is a system which is administrated by the Government and therefore is not prone to speculations and market forces like our fragmented superannuation system in Australia. The aim of the Swiss pension system is to provide security and dignity to older people. An important point in Toohy's excellent analysis is : "Given their limited resources, governments should not fund massive budget subsidies for super as well as the age pension. Once governments fund the pension as a decent safety net, they have fulfilled their basic welfare obligation to retirees. Anyone who wants to save more can do so". Also :'Compulsory saving imposes a deadweight loss as it distorts decisions about which savings vehicles to use, as well as between consumption and savings. In particular, younger people may be less able to invest in their preferred mode of savings (for example, owning their own home). This 'deadweight loss' is a loss to an economy that depends on purchasing power. Like the GST it is regressive. It takes money from the market that is essential to keep the market turning. Denying the economy this expenditure hastens the next recession when some of it is returned in stimuli that returns some of it back to where it should never have been taken. We are taking the European road that is dictated by the economic-raionalists who turn rational economics on it's head. Keeping the banks afloat is more important than keeping the real economy afloat. What I suggest is to look at a model which actually works. The Swiss model of caring for the elderly seems to be working because the Government does not have to spend a large proportion of its budget for pensions and aged care like it is the case in Australia. In Switzerland pensioners in fact often have a higher disposable income and are an important part of the economy. Pensioners in Switzerland do not need or get even concessions on public transport. Most of them can live in comfort and with pride. Brian Toohey has been conducting a campaign against super for a while now, and it is never clear why. There are only three savings catagories, land, capital and cash. People should view super as a vehicle to save cash, however like all strategies one should have a balanced approach which means owning a reasonable family home and purchasing shares with any additional savings one may have. I would have thought the Greek fiasco is an example of the shortcomings of relying on a pension system reliant on Government. The idea that the age pension never runs out is magic pudding stuff. The tax rebates and the move to 12% or imo the better option of moving to 15%, are mutually exclusive. Moving to 12 or 15% sits within traditional labor values of providing welfare thru the wages whereas the tax concessions are traditional Tory values of providing tax rorts for the well off. Treasury hates superanuation because because it frees people from the yoke of bureacratic interference in their lives. They must prefer a cash transfer system where unelected officials determine how much you are entitled to. Giving people a 9% pay rise by getting rid of their super contribution sounds fine, but the one thing that history has shown us is that people will not save but more likely spend. Historically the biggest issue facing the Australian economy has always been the savings defecit. Using super with help turn Australia from a debtor nation into a creditor nation. And having saved for our own income in retirement means that tax dollars can be directed into other areas of the economy like health care and education, or if you think the size of government is too big, then reduced taxation. ALP has been captured by the finance industry, beginning with its engagement with superannuation policy. Kevin Rudd's CPRS, with its proposal to leave the economic and environmental future of the nation to the tender mercies of profit-seeking traders and financiers, was perhaps the high point of this infatuation. Even now, the Clean Energy Futures dog's breakfast of a policy is intended to ultimately transform itself into an Emission Trading Scheme. Sensible climate policy would be to create a fossil fuel consumption tax, with the revenue raised by such a tax returned to taxpayers via equitable cuts in income and company tax. Sensible policy such as Reasonable Benefit Limits seems to have been forgotten, along with equity itself. At the 1937 federal election, the United Australia Party had promised to introduce a system of national insurance that would provide medical cover and pensions for working people. The scheme was to be funded by contributions from government, employers and employees. Menzies, who had helped draft the policy, was an enthusiastic supporter of the scheme. For him it constituted good social policy and, once adequate superannuation funds had been accumulated, promised to relieve taxpayers of what was likely to become an intolerable burden in the future. Unfortunately the United Australia Party’s coalition partners were not nearly so keen about the proposal. Although a National Insurance Bill was passed, Country Party ministers continued to resist its implementation, arguing that the money was needed elsewhere, particularly to provide for ‘adequate defence’. After a series of stormy meetings, Cabinet succumbed to Country Party threats and decided to repeal the pension provisions of the Bill. Menzies immediately resigned from the ministry. Where would we now stand if each party was contributing 5% of the going rate since 1937? Our savings would be huge.